Otis W. Morrow, local Attorney, assisted Ms. Wilkins in creating the Foundation and serves as a Member of its Board of Trustees. Ms. Wilkins cousins, C. Grant Wilkins and James M. Wilkins, both prominent business men of Denver Colorado, were appointed to serve as Trustees by Ms. Wilkins. Karen E. Zeller, local business woman, is the fourth sitting Member. V.J. was born August 27, 1921 to Morris Wilkins and Nola (Beam) Wilkins. She moved to Arkansas City at the age of 9 from St. Louis Missouri and graduated from Arkansas City High School in 1939. VJ continued her education at Stephens College in Columbia, Missouri and then at the University of Arkansas where she was a member of the Kappa Kappa Gamma sorority. She worked for a number of years for her father at the Dixie Portland Flour Mill. VJ was very active in the Women's Golf Association at the Arkansas City Country Club, a member of Junior Service League and several bridge clubs. She was a member of the First Presbyterian Church of Arkansas City, serving several terms as elder and deacon and also serving on the Finance Committee, the Church Officer's Nominating Committee, and the Church Renovation Committee and she sang in the Chancel Choir for many years. On March 7, 1892, the Fortnightly Club, consisting of “civic- minded ladies,” established a book collection for its members. In November 1896, this collection was opened to “a limited number who shall be called Library Members.” The Y.M.C.A. also sponsored a reading room, but it was not until April, 1900, that Miss Lillie R. Gilliland attempted to organize a library. 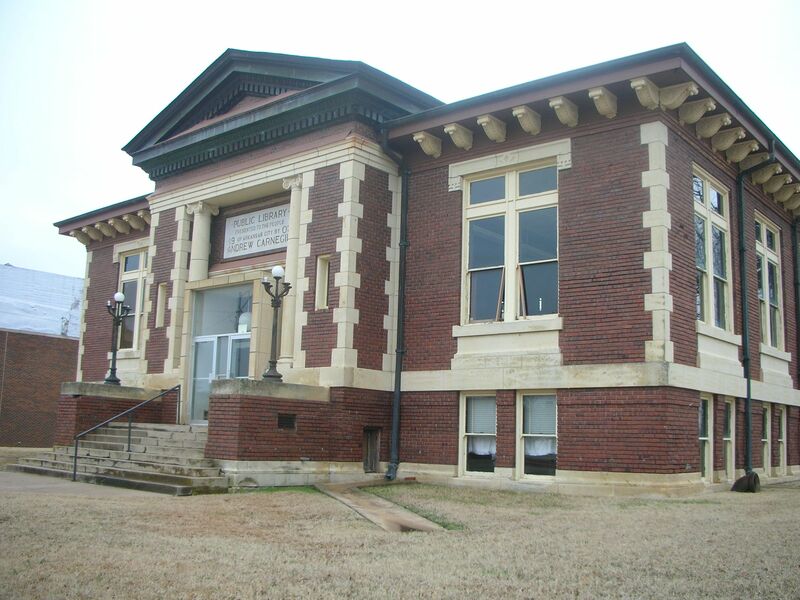 She established a circulating library, called the Arkansas City Library, and it was situated in the Commercial Club Assembly Room. It had 75 members who paid $1.00 each for a membership fee. The collection consisted of 500-600 volumes. At the end of the year the Commercial Club “failed to vote any help for the Library,” and Miss Gilliland gave away or sold the books at this point. After the demise of the “city library,” the St. Cecilia Club, a ladies’ musical society, produced concerts to raise funds for a public library. On April 15, 1904, after considerable promotion, the proposition “to establish and maintain a free public library” was brought to a vote, but was defeated. N. D. Sanders, “an enthusiastic advocate” of a library, entered into correspondence with Andrew Carnegie who responded with a generous offer of $16,000.00 for a building. This was on April 10, 1906. (The amount was later increased to $18,400, provided that “Council guarantee a corresponding increase in the maintenance fund.”) On June 28, 1906, the electorate voted to support a public library. The first Library Board was established July 11, 1906. A site at Second Street and West Fifth Avenue was chosen and six lots were selected and purchased. The architectural firm of Smith and Shenck of Fort Worth designed the building. The contract was let for no more than $16,000.00 to George E. Hopper, but the building was finished under the supervision of J. Y. Davis. The plumbing was done by James Bays, and decorating and interior finishing was contracted by Cooper & Heydorf Bros. The library board spent $2,600.00 on the grounds, and the building cost was $18,400.00. The Fortnightly Club donated 600 volumes to the 3,000 volumes purchased by the board, thus the library was opened with 3,600 volumes. The dedication was held August 5, 1908. A. J. Hunt, president of the New Era Mill, gave the dedicatory address. Miss Hattie Osborne, a Library Science graduate, was hired for six months starting July 1, 1908, to catalog the books and to train Mrs. A. B. Ranney, who served as Head Librarian for the next 24 years. At first, the library contained mostly donated books and periodicals, but by the end of 1910 the library owned 3390 books and 20 periodicals. Throughout the years, the library has been enriched by gifts and memorial donations of books, periodicals, art objects, and furnishings through the generosity of its supporters. As the city grew, the library kept pace. During the Depression, circulation leapt to over 100,000 books per year, telling a silent tale of need fulfilled during those lean years. Building improvements were made through the years with the idea of maintaining the original style of the building but still keeping pace with the times. A new entrance was added in 1960, complete with glass vestibule. A mezzanine was built in 1965, which provided shelving for many additional books. Finally, the library holdings outgrew the facilities and in 1980, the Library Board acquired the old post office building at the corner of 5th Avenue and A Street. After extensive remodeling of the building, the library was moved to the new location in November 1980. Today, ACPL promotes free and open access to information, materials, and services to all members of the community to advance knowledge, foster creativity, encourage the exchange of ideas, build community and enhance the quality of life. We celebrate creativity and inspiration. Collections include movies, books and magazines to entertain and inspire. We offer programs in the humanities and arts that encourage people to think and talk about values, history, art, and other cultures that are integral to the library’s mission.